A newly developed filter, which removes more than 99 percent of heavy metal toxins from water, shows potential for water remediation in developing nations around the world. The project, developed in collaboration between Swansea University and Rice University, has won both national and international awards. 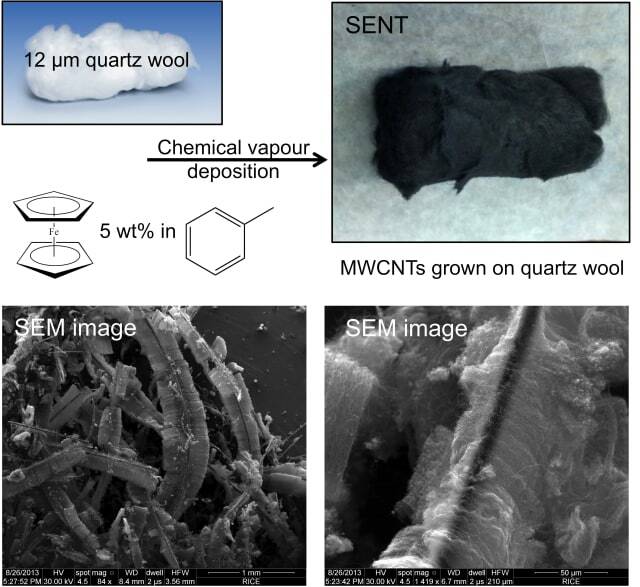 Carbon nanotubes immobilized in a tuft of quartz fiber have the power to remove toxic heavy metals from water, according to researchers at the Energy Safety Research Institute at Swansea University in collaboration with researchers at Rice University. Prize-winning filters produced in the lab of professor Andrew R. Barron by then-high school student and lead author Perry Alagappan absorb more than 99 percent of metals from samples laden with cadmium, cobalt, copper, mercury, nickel and lead. Once saturated, the filters can be washed with a mild household chemical like vinegar and reused. The researchers calculated one gram of the material could treat 83,000 liters of contaminated water to meet World Health Organization standards, enough for supply the daily needs of 11,000 people. The lab's analysis of the new filters appears in Nature's open-access Scientific Reports. The robust filters consist of carbon nanotubes grown in place on quartz fibers that are then chemically epoxidized. Lab tests showed that scaled-up versions of the "supported-epoxidized carbon nanotube" (SENT) filters proved able to treat 5 liters of water in less than 1 minute and be renewed in 90 seconds. The material retained nearly 100 percent of its capacity to filter water for up to 70 liters per 100 grams of SENT, after which the metals contained could be extracted for reuse or turned into a solid for safe disposal. While the quartz substrate gives the filter form and the carbon nanotube sheath make it tough, the epoxidation via an oxidizing acid appears to be most responsible for adsorbing the metal, they determined. Alagappan, now an undergraduate student in engineering at Stanford University, was inspired to start the project during a trip to India, where he learned about contamination of groundwater from the tons of electronic waste that improperly end up in landfills. "Perry contacted me wanting to gain experience in laboratory research," said Barron, "and since we had an ongoing project started by Jessica Heimann, an undergraduate who was taking a semester at Jacobs University Bremen, this was a perfect match." Barron said the raw materials for the filter are inexpensive and pointed out the conversion of acetic acid to vinegar is ubiquitous around the globe, which should simplify the process of recycling the filters for reuse even in remote locations. "Every culture on the planet knows how to make vinegar", he said. "Where this would make the biggest social impact will be in village scale units that could treat water in remote locations in developing regions, however, there is also the potential to scale up metal extraction, in particular from mine waste water." Alagappan's research won a series of awards while he was still a high school student in Clear Lake, a Houston suburb, as well as a visiting student in Barron's Rice lab. First was the top prize for environmental sciences at the Science and Engineering Fair of Houston in 2014. That qualified him to enter the Intel International Science and Engineering Fair in Los Angeles the next year, where he also took the top environmental award. "It's been a tremendous honor to be recognized on an international level for this research, and I am grateful for the opportunity to work on this project alongside such a talented group of individuals,” said Alagappan. “I also especially appreciated being able to meet with other young researchers at the Intel International Science Fair and the Stockholm Junior Water Prize, who inspired me with their firm commitment to elevate society through science and technology." Can we engineer clean drinking water? Follow the link to find out how you can help with this challenge.